Formed in 1996 by Ann Miller, the Ltd. Company based in Aberdeenshire works with keen gardeners, companies and research institutes throughout the UK, Europe and World Wide. 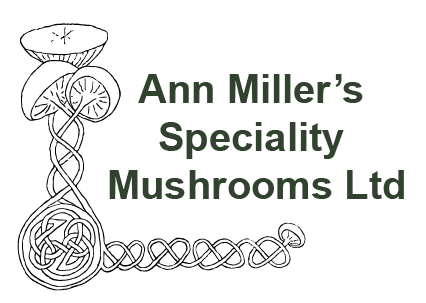 Ann Miller’s Speciality Mushrooms Ltd produces a large range of mushroom spawn for amateurs and professional growers alike. We are as happy working with individuals as large companies and if not a standard product we will endeavour to make it to order for you. We have sourced our fungal strain through out the world both from UK wild sources and also high yielding commercial strain. Over the last 20 years these isolates have been trialed throughout the UK and Europe. This give us a tremendous depth of knowledge to support our customers to grow wonderfully tasty mushrooms on a variety of substrates in a multitude of different way.